On an uncomfortably cold day like today, you might not believe me when I tell you that spring IS just around the corner. Sure, plenty of very cold ( and even snowy) days probably still lay ahead, and the March winds which blow off Mt Tsukuba ( the Tsukuba Oroshi) can be frosty and brutal ( for cyclists especially). But I`m not talking about the temperature. When I speak of spring I am thinking of all the VEGETATION, all the GREENERY which in the coming weeks will start emerging from the soil. Already this week I can sense all of that LIFE, chomping at the bit, getting ready to burst forth. You can almost hear it. I decided to start out by heading to the area above which I have often seen, in recent weeks, one of our neighborhood goshawks ( O-Taka) perched high up on some sort of communications tower. I thought that perhaps it was around there that the majestic birds will be nesting this year. Stepping into the woods in my neighborhood can sometimes be creepy. With all the owls, and the goshawks, there are often plenty of small animal and bird remains, the feather, fur and bones, which the birds of prey ( and later the scavengers) leave behind. Right away, I knew that the goshawks were active in that area. The route I had chosen was littered here and there by blotches of such leftovers. There were also plenty of hawk droppings. Getting deeper into the forest, I often stopped to scan the canopy ( still thick in winter because of all the evergreens), in the hope of spotting a nest. Just at the point which was probably furthest from any road ( in any direction), I found it, letting out a big WOW! Very impressive- amazing, even suddenly coming across it. I then resumed my ground search in the general area around the nest. About 20 meters east of the grand tree high atop which the goshawks had chosen to make their home, was a little slope- the remains of an ancient burial mound (kofun, 古墳). Still scouring the ground, I slowly proceded up it. What I found on top almost made me forget all about the nest- in fact it brought me back the original purpose of this hike- marvelling at the interesting withered vegetation of winter. Of course, by this time of year these plant`s flowers had long disappeared. So what, you may ask, makes them so special. Well, after their blossoms have fallen away, the fruit of this lily appears. Eventually, this dries, too, and opens up into three petal-like parts- which are connnected by what look like fine filaments. Really something special to look at. And how strange I thought that, though many types of lily flowers are spectacular, the UBAYURI`s blossoms are rather dull and plain ( though they ARE large!). 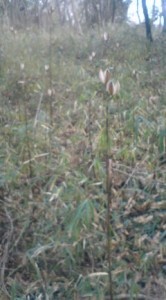 That means in winter, without their white cone-like flowers, they are probably more attractive than they are in summer! In fact, they are often added to winter flower arrangements, as symbols of the season. 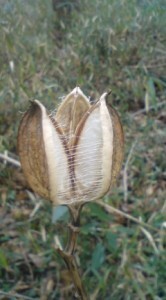 Looking closely I could still find some of the lily seeds with had been blown out of their casing. 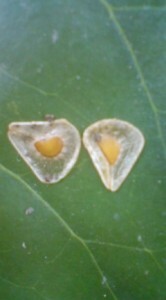 These, too are remarkable to examine, as they look like very finely sliced flower bulbs. 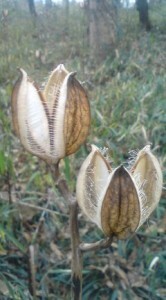 Since lilies are famous BULBS, some are surprised to hear that they also have seeds. Well, they do, and they are worth a close look. Japan is considered to be something of a TREASURE HOUSE of lillies, with more than 10 indigenous species ( some of which were introduced to Europe in 1829 by the German physician Von Siebolt, who was at the Dutch trading post of Dejima, Nagasaki). And though the Europeans and others took up these flowers with great enthusiasm for decorative purposes, in Japan ( and the rest of North-East Asia) lilies have not only been admired for their beauty and scent- they have also been EATEN. The bulbs of various types of lily were an important source of starch for the ancient Japanese andYuri Ne ( lily bulbs) are still an important feature of Japanese special O-Sechi dishes eaten over the New Year holiday. When cooked these bulbs look like pieces of GARLIC (also bulbs) when served, and their texture is also quite similar to the STINKY ROSE. Their flavor , however, is very subtle and starchy, and is influenced by the seasoning used ( as opposed to influencing the taste of everything else, as garlic does). One very interesting thing that I learned after I got back from my walk and started doing a little research on the UBAYURI was that a larger type of the same lily, called the O-Ubayuri (Cardiocrinum cordatum var. 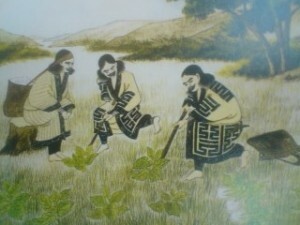 glehnii) is one of the most important food sources for the Ainu people. 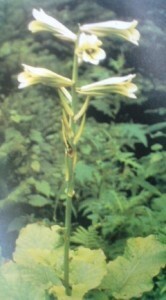 The O-Ubayuri grows mostly in Hokkaido and in the colder, snowier, Japan Sea side of Northern Honshu. In a couple of weeks I plan on going back to that same spot and dig up a few of the bulbs and try to make some Japanese dishes with them. 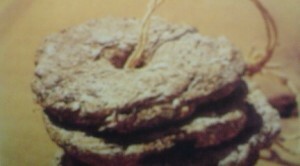 I think I will give TUREP a try , too, using the smaller type of UBAYURI. And I hope that before the bulbs are ready for the taking, I will be able to get back a coupek of more times to enjoy Tsukuba`s wonderful winter wilds. Mito`s Special UME-FLAVORED Sweets Greatly Enhance Plum Blossom Viewing- and are great any time of year! Avi-san you are living quite a good place near township and near big area of plenty of nature both animals birds and wild flowers. You wrote one of your neighbor goshawks, that means there are few of them? Can you sight them with ease? Also there are owls? Is that possible to watch them in daytime or should I spend several hours in midnight preparing sleeping bag? I have never seen them so I wish I have opportunitie to watch or for owl case only to hear their voices. We call owl Fukuro or Mimizuku, zuku means tree-rabbit(木兎） in Chinese letter it was said their legs looked like those of rabbit and Mimi means ears because top feathers of owl resemble ears. Zuku→tuku⇒tsuku⇒Tsukuba, City administration made Owl as a symbol bird of Tsukuba-city in 2002. 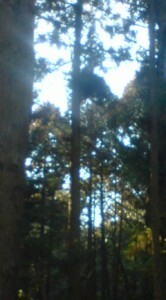 It sounded a little bit distorted, but owls are living in Tsukuba and they somehow intelligent and lovely birds. So I don’t mind. Please you never mind too! Yuri bulb think I ate in a Japanese Hotel in rural area many years ago but only slight impression of its taste like Kuwai(arrowhead). If they were sold in supermarket in certain time of year, I would like try to eat again thinking about history of Inu people. Yes, the area in Tsukuba in which I live IS quite fantastic in terms of nature and historical sites. 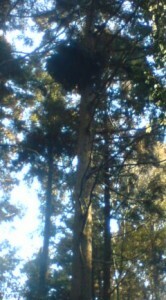 There are two goshawks, a mating pair, a pair of SASHIBA, and numerous owls. If you would like to go owl watching, I would recommend starting just before dawn. I often see large owls- FUKURO, perched on top of utility poles at that time. Its excting to see them fly, silently away. But in the night time, especially in the late spring, the hooting of the owls is anything but quiet. It can keep you awake at night. Sometimes I want to open the window and shout- STOP MAKING ALL THAT RACKET- but I never do, not wanting to disturb their mating rites. The goshawks can be seen in the day time. They can often been seen soaring so high that they are barely visible. At other time, though you can never predict when that would be, they come VERY close overhead. Once, only once, one of the O-Taka perched for a short while on my veranda. A happy surprise!